This Brosnan antique brass finish dimmable 18w neutral white LED pendant light is on trend, energy efficient and perfect for over a dining table or as a kitchen pendant. Supplied with a manufacturers 3-year warranty. Circular ceiling mount and adjustable height black cord suspension, with tear-drop antique brass finish metal shade containing a dimmable 18w neutral white LED module that supplies a bright 1480 lumens of downward light. A modern, bright, energy efficient lighting solution, with smooth, sleek lines and neutral white LED’s. A great choice for adding contemporary style to any dining room, kitchen, living room or hallway. Height adjustable at the time of installation by shortening the suspension cord, please see the technical information for dimensions. 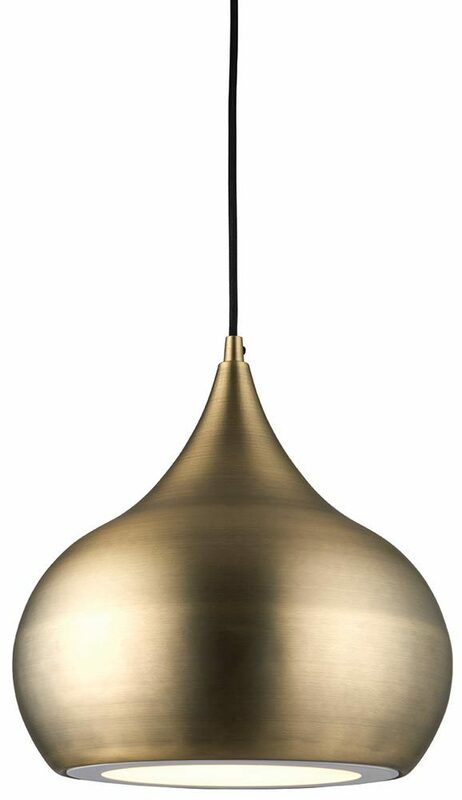 The Brosnan LED lighting range includes a matt nickel finish pendant that can be viewed below. A class 2 double insulated LED pendant light, no earth required. Please follow this link to download or view the installation instructions.